Over the last 12 months Sharethrough has run a series of research programs to look at the effectiveness of native ads benchmarked against pre-roll and standard banners. In this research Sharethrough / IPG Media Labs surveyed 4,770 consumers and used the latest eye-tracking technology to assess the attention of 200 consumers to better understand users visual attention and attitudes for native ads vs standard banner ads. 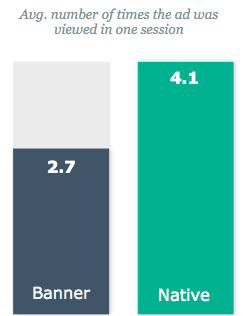 25% more consumers were measured to look at in-feed native ad placements than banner ad units, even when banner ads were placed above the fold and native below. For this research Sharethrough collaborated with Nielsen to study the comparative brand lift for native video ads vs pre-roll to see which was most effective. In all campaigns measured for the case study, pre-roll drove little/no brand lift. 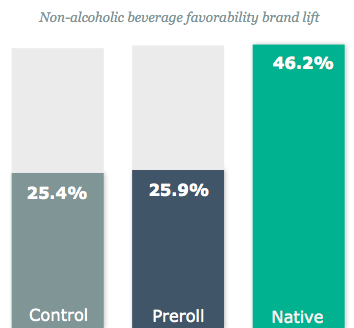 Users measured in the case study were more likely to respond to the brand survey negatively after being exposed to the pre-roll creative than the native ads.